This one is a combination of the last two books, the metallic and stone finishes, with a wood grain finishes and Trompe l’Oeil effects added. It does cover the water based paint and glazes that are used for this now that it has moved in to the arts& crafts area from the professional. Also Primers and Finishes, Preparing the surface, Tools for Faux finishing, A Glossary of Techniques. The added section on Wood Grain Finishes, includes basic Wood-graining techniques, and then goes into Oak, Zebrawood, Mahogany, Satinwood, Maple, Bird’s Eye Maple, Tiger Maple, and a Burled Wood finish. They have also added Bone and Horn finishes for a little variety. In the Marble and Stone finishes section, they have the listed stones in the previous book on the subject, but have added grout lines. As faux tile whether on walls or canvas floor covering or even the floor had become a hot decorating fashion at the time. 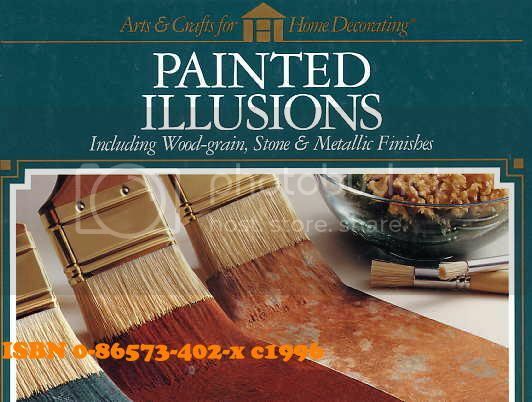 In the Metallic Finishes section, they show an Antiqued Metallic finish on painted surfaces, Metal-leaf finishes and Metallic Composite Stenciling. It covers a rusted finish, copper, brass, bronze verdigris finish. As a side note, for those that may not know. The crafts paint industry has come up with some interesting coatings. They have a product that is called instant rust, an acrylic base antiquing solution that generates rust which can be controlled by the heaviness and number of applications. Again this may be something for the mixed materials pieces that can’t rust on their own. And Finally, it covers Trompe l’Oeil effects. Hand painted Trompe l’Oeil , and the Trompe l’Oeil Stenciling. Some of the really good artists are able to create a visual and feeling of space with the techniques, so much so people have walked in to flat walls and tried to open painted doors. It is used in a lot of Mediterranean restaurants, to give the feel of looking out over the village or seascapes. It will give the person enough information to give a effect of something akin to the real thing.